Modern scientific thought owes itself to the contributions of many great men and women. Without these individuals, our universe would, quite literally, look very different. However, there are two scientists in the field of cosmology who stand out among all the rest: Edwin Hubble and Georges Lemaître. By 1930, other cosmologists had concluded that the static (non-evolving) model of the universe was unsatisfactory. This discovery was largely due to the efforts of Edwin Hubble. Using the world’s largest telescope, which is located at Mt. Wilson in California, Hubble showed the distant galaxies all appeared to be receding from us. What’s more, these far-flung galaxies were traveling away from us at speeds proportional to their distances. In other words, the farther they are from us, the faster they are flying away. Enter Lemaître. Lemaître used these findings to draw attention to his earlier paper, in which he explained the relationship between the distance of a galaxy and the recession velocity of that same galaxy. By putting together Hubble’s observations with Lemaître’s paper, a majority of astronomers became convinced that the universe was, indeed, expanding. This revolutionized cosmology and how we see the universe — and how we view our place within it. Why was this find so notable? Shortly after this discovery, Lemaître reasoned that traveling back in time should lead to an epoch in which all the matter in the universe was packed together in an extremely dense state, which is known as a kind of primeval atom. And this was the birth of Big Bang cosmology. 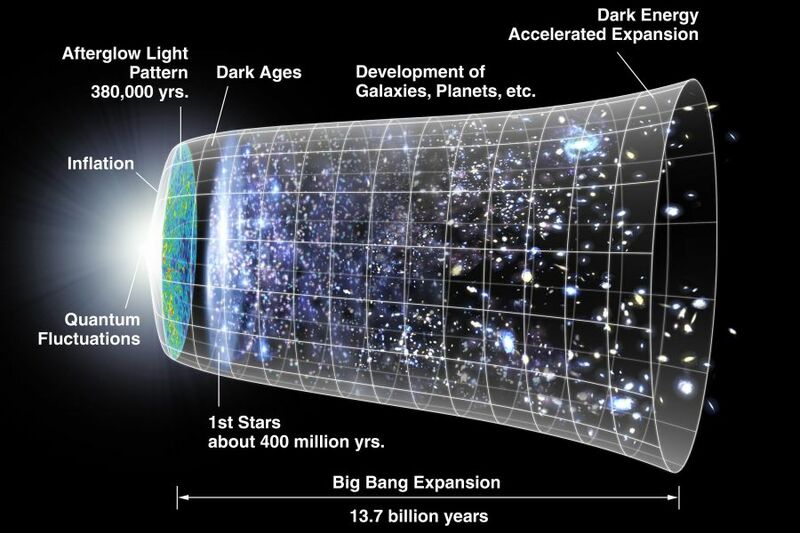 So, let us take a moment to delve into the Big Bang — into the timeline of everything that has ever existed. Cosmologists have come up with several possible speculations as to what existed before the big bang (if anything existed at all). If these seem rather presumptuous, it’s because they are. It’s entirely possible that thew was no previous era. Assuming that this is true, it means that matter, energy, space, and time began abruptly. Perhaps this abrupt change sprang from a collision with a parallel universe. Or maybe something else. We really don’t know. Another theory is “Quantum Emergence.” According to this view, space and time developed out of a primeval state described by a quantum theory of gravity. Notably, we don’t have an explanation for quantum gravity just yet. So we can’t say much beyond that. There’s the landscape multiverse of string theory, which deals with differences of quantum tunneling and quantum fluctuations between different energy states. There’s also the cyclic universe. In this theory, the Big Bang is just the latest “big bang” in an endless stream of big bangs — in the continual expansion, collapse, and renewed expansion of space and time. But as I said, there is no ultimate contender, so let’s leave that for a moment and take a look at what we *do* know. 10^ -43 seconds: this is the Planck era, the earliest known meaningful time. 10 ^-35 seconds: cosmic inflation creates what is known as quark–gluon plasma. Protons and neutrons cannot exist yet, only leptons and quarks (with their force carriers, gluons, W and Z bosons and photons). We know the quark soup exists because we have created similar conditions inside particle accelerators. It appears that it is this early quark soup that gave rise to dark matter. Additionally, The quark soup is likely the phase in which matter gained superiority over antimatter (lucky us). Ultimately, cosmologists speculate that the universe had equal amounts of each but, at some point, it developed one extra quark for every billion antiquarks. This imbalance ensured that enough matter survived annihilation as the universe expanded and cooled. (at 10 ^ -11 seconds this battle is starting to give favor to the rise of matter over antimatter). At 10 ^-5 seconds: protons and neutrons are formed from quarks. Within the first 300 seconds of the existence of the universe, the elements helium, lithium, and heavy hydrogen (deuterium and Helium 3) form from the protons and neutrons by a process called nucleosynthesis. 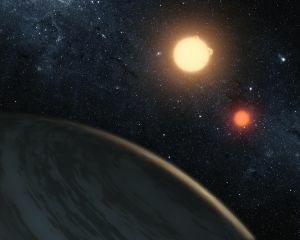 Nucleosynthesis is the theory that accurately predicts the abundances of elements and isotopes measured in the primeval samples of the universe i.e., in the oldest stars and high-red shifted gas clouds. The abundance of deuterium plays a special role in this process: Its measured value implies that ordinary matter amounts to 4.9% of the total energy density in the universe (the remainder is dark energy and matter). This agrees with the data collected by Planck from the CMBR. This is an amazing triumph as two completely different measurements, one built on nuclear physics when the universe was a second old and the other based on atomic physics when the universe was 380 000 years old, agree with one another. This verification is a strong indication that our model of the universe is accurate. So, let’s take a look at our universe from this era. You’ve probably heard the old adage, “a picture is worth a thousand words.” Well, in this case, the pictures is worth roughly 900 million dollars. I am talking about ESO’s Planck Satellite and its “baby snapshot” of the universe i.e., the cosmic microwave background radiation (CMB). This image reveals the age, density, geometry, and overall composition of the entire early universe. On top of this, the image provides evidence supporting inflationary cosmology via the information that we can extract from it. In essence, quantum fluctuations causing temperature differences in this inflation field (on the subatomic scale) get exponentially blown up to astrophysical sizes. The most remarkable thing about this is that observations of the cosmic microwave background radiation (from WMAP and ESO’s Planck observatory) agree with the prediction of inflation, providing the strongest evidence for this theory yet. 380, 000 years: when the nearly uniform soup cooled to about 3000 Kelvin, atoms formed nuclei and electrons. Photons ceased to scatter and streamed through space unhindered, turning the prior opaque universe into one with visible light. 100 million years: the limit of current observations, that is, the highest red-shifted objects detectable (the oldest objects that we can see) are at a time of when the universe was 600 million years old. Two future projects that have already begun construction, the James Webb Space Telescope and the Square Kilometer Array, are specifically designed to shed some light on this era and (hopefully) bring the dark ages to an end. 9 billion years:our solar system forms (yay us!). The ultimate fate of our universe hinges on dark energy. If the universe continues to grow at about the same pace, this will result in all the last stars burning out in about 100 trillion years (so we’ve got some time left anyway). If this is true, at 30 billion years all other galaxies are pulled from our view and all evidence of the big bang is lost forever (it may be possible that future astronomers could deduce its existence using a few methods…but hopefully we keep good records). Dark energy could also intensify, resulting in a “Big Rip” scenario. From superclusters to atoms, dark energy effectively tears everything apart. This would happen at approximately 50 billion years. Alternatively, dark energy could slow down. This deceleration, ould give gravity the upper hand and lead to a collapse. And at 30 billion years, we could have what is known as a “Big crunch”. This could result in a new big bang from the cyclic universe scenario. The nature of universe is anything but simple, but cosmology has made leaps and bounds in such a short period of time because of technology and the rigors of the scientific method. If we can take anything from this invaluable knowledge, is that the march of scientific must continue…because the universe sure isn’t going to slow down and wait for us to catch up.